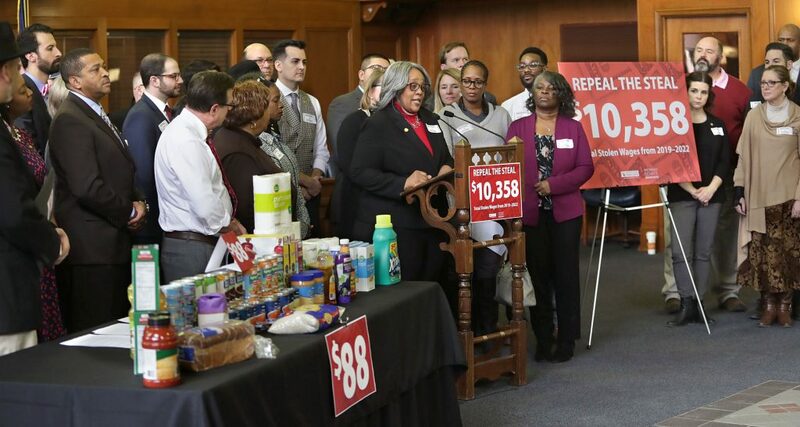 LANSING — Sen. Erika Geiss (D–Taylor) and Sen. Betty Jean Alexander (D–Detroit) today joined other lawmakers at a press conference to announce legislation that would provide a livable wage to minimum wage workers after Republicans gutted the minimum wage increases in December. The senators were joined by House Democratic Leader Christine Greig (D–Farmington Hills), Rep. Bill Sowerby (D–Clinton Township), Alicia Farris from One Fair Wage, Antonieus Gregory, a restaurant worker from Romulus, and Nickie Gaston, a homecare worker from Redford. Senate Bill 168 and House Bill 4299 would amend Public Act 368 of 2018 to reinstate the minimum wage increase in the original ballot initiative, which increased minimum wage to $12 by 2022. With the changes made in last-year’s lame-duck session, minimum wage workers stand to lose out on nearly $1,200 in wages in 2019 alone. By the end of 2022 — when the wage was originally supposed to reach $12 under the ballot initiative — families will have lost out on nearly $10,300 in wages.